Oijanen system, The Forge region. On the 13th of October at 18:50 EVE Standard Time, a large scale battle unfolded in the system which saw the demise of 2 Revenant super carriers as well as many capital and sub capital ships in what can only be termed as pure carnage. The battle was prompted by Project.Mayhem. 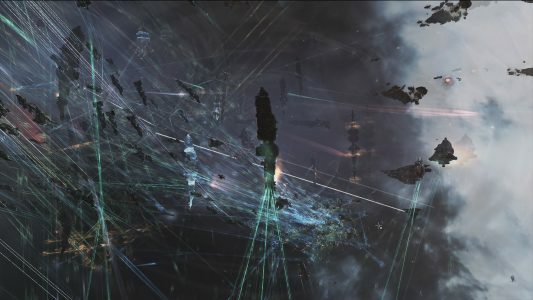 [16-13] and Snuffed Out [B B C] who reinforced a Legion of xXDEATHXx [X.I.X] Fortizar in the system in order to provoke a fight. Expecting a hard battle, especially as the Oijanen system lays adjacent to Legion of xXDEATHXx’s staging system of BWF-ZZ in the Geminate region, Project.Mayhem. and Snuffed Out formed a joint 190 pilot Machariel battleship fleet with a moderate capital wing held in reserve, including many dreadnoughts, carriers and force auxiliaries. The fleet then bridged into the system with 2 Apostle force auxiliaries in tow on a safe citadel. The hope of the Snuffed Out\Project.Mayhem. fleet to reach the system first and set up for the fight was quickly dashed when it found the Legion of xXDEATHXx forces already set up on their Fortizar. What was especially astounding was the array of forces Legion of xXDEATHXx had prepared for the fight. While Snuffed Out\Project.Mayhem. had expected to be outnumbered, they found themselves staring at no less than 2 Proteus strategic cruiser fleets, numbering a total of 400 pilots altogether, of members of the Geminate Coalition (GemCo), supported by 2 Tengu strategic cruiser fleets belonging to SOLAR FLEET [SOLAR] and Vanguard Coalition (VG), each estimated at 80 pilot strong. The entirety of the Drone Regions Federation led by Legion of xXDEATHXx (DRF) was present on the field. With such a force assembled against them, Snuffed Out\Project.Mayhem. had to call for reinforcements. 2 alliances answered their call, an Out of Sight. [OOS] Tengu fleet in a sniping configuration called “Slippery Pete” of 40 pilots, and a Circle-Of-Two [CO2] Proteus fleet of 200 pilots which raced to the system and joined Snuffed Out\Project.Mayhem. forces on a safe citadel. With reinforcements in, the two sides kept to their respective citadels, waiting for the other to make a move. In the meantime, the Legion of xXDEATHXx Fortizar exited its reinforced mode and repaired itself, securing the objective for the DRF. Snuffed Out\Project.Mayhem. refused to engage the DRF on its own Fortizar, due to its void bomb defenses which would wreak havoc with its logistics and main fleet. Instead, choosing to attempt and bait a fight out of the DRF, Snuffed Out\Project.Mayhem. warped its Machariel fleet with its 2 Apostles to the Airaken gate and set up on it. Before too long the DRF 2 Proteus fleets warped on top of it and the two sides opened fire, starting the fight. The two fleets brawled at point blank range, the Machariel fleet trying to burn away from the Proteus fleets and put some distance between the two fleets, as the battleships’ auto cannons were having difficulties tracking the smaller, nimbler strategic cruisers. As the battle developed and the two sides exchanged blows, more fleets joined the melee. The two Tengu fleets warped at medium range of the fight, staying around 50 kilometers from the Machariels and focusing on their Guardian logistics cruiser wing. The Circle-Of-Two Proteus fleet warped in to the center of the fight, before pinging and coming back again, this time remaining at around 70 kilometers of the hostile Proteus and Tengu fleets. Out of Sight. remained on the outskirts of the fight, attacking enemy logistics ships at maximum range, staying well away from the main fight. The different fleets maneuvered on the grid, maintaining close to medium range from one another, trading losses. Battleships and strategic cruisers either vanished in devastating volleys, or slowly but surely overcome by concentrated, repeated barrages of rail guns, laser batteries and auto cannons. Logistics wings on both sides struggled under the numerous distress calls made by their comrades, as the two sides concentrated on specific fleets. For the DRF, its entire firepower was focused on the Machariel fleet, which retaliated with its allies, hitting hard at the Proteus fleet. Yet as the two sides continued to fight on, the exchange was slowly and surely going in favor of the DRF. The Machariel fleet was bleeding ships faster than its enemies, and considering it was already slightly outnumbered, this was a cause for concern. In order to stabilize the situation, the Machariel fleet lit a cynosural beacon on the field and brought in 2 more Apostles in order to help it tank the incoming damage. Though unable to completely stave off losses, the addition of the Apostles managed to slow the rate of casualties. As the battle wore on and the Machariel fleet showed signs of stabilizing, the DRF side decided to escalate things further, dropping 6 dreadnoughts on the field. Lighting a cynosural beacon within the maelstrom of battle, the DRF dreadnoughts materialized on grid and entered their siege cycles. These capital ships were fitted to combat sub capitals, and their addition to the DRF side could have tipped the scales back to its favor. However Snuffed Out\Project.Mayhem. was not about to let it pass. Lighting its own cynosural beacon near the hostile capitals, 19 Snuffed Out\Project.Mayhem. dreadnoughts jumped into the system, deploying in the midst of the bitter fighting and targeting their brethren. Before they could even open fire, DRF escalated once more, bringing 20 more dreadnoughts, springing its trap. Within moments the grid devolved into a brutal capital exchange. Dreadnoughts on both sides traded blows, with the Machariel fleet adding its firepower to the mix. As the capitals brawled, firing powerful salvos at each other, the DRF and Circle-Of-Two fleets continued to concentrate on their original targets, seemingly oblivious to the enfolding battle between the giants that was fought right next to them. Losses continued to pile for both sides as more and more ships were consigned to oblivion, the dreadnoughts soon joining their comrades in the developing field of debris that was now the Airaken gate. Though having more dreadnoughts, it was the DRF that was losing the capital exchange, the Machariels proving to be a huge factor in the fight. Realizing that with their force auxiliaries on the field the Machariel fleet could continue and fight effectively on the field, the remaining dreadnoughts as well as the Proteus fleets changed the target of their fury, zeroing on the Apostles. One by one, the force auxiliaries caved in to the relentless barrages, though each trying to stave off its inevitable demise for as long as possible. yet Snuffed Out\Project.Mayhem. had foreseen this move and had staged more force auxiliaries in range of the fight for just such inevitability. Thus, as each Apostle was removed from the field, a new one was brought in to take its place, using the still lit cynosural beacon on field. This concentration of firepower was costing the DRF. As its capitals and sub capitals focused their fire on the Apostles, their own fleets came under renewed fire from the Machariels, as well as the continued fire of the Circle-Of-Two Proteus fleet. The scales were now tilted deeply in favor of Snuffed Out\Project.Mayhem. and its allies. With Out of Sight. having thinned the ranks of the DRF Proteus fleets’ logistics wings, and the Machariels focusing again on Proteus and Legion strategic cruisers, losses started soaring for the DRF. Whats more, Circle-Of-Two, sure of its position and impatient, charged into the fray, closing the distance between it and the hostile Proteus fleets and switching to close range, high damage ammo. Facing dwindling capital numbers and mounting losses, the DRF decided to further escalate, this time bringing an entire super capital squadron to the field. A cynosural beacon was lit 40 kilometers from the raging battle, and 18 super carriers hit the grid, their squadrons of fighter bombers rushing out to take down the enemy capitals. Perhaps the DRF thought that Snuffed Out\Project.Mayhem. would hesitate to counter escalate so close to the DRF’s staging system, or that the committing of super capital assets would intimidate its opponents. Whatever the initial thought behind this move was, the DRF fleet commanders would soon come to regret it. Unknown to the DRF fleet commanders, 2 Revenant super carriers sneaked into the super capital group. This proved disastrous, as the super capital squadron was primarily set up as an armor fleet, with accompanying Apostles for remote armor repairs. It was not capable of supporting shield based super carriers such as the Revenants. The allied fleets overcame their initial shock from this move, and recovering their senses burnt towards the super capitals, firing on the move as they attempted to swarm the behemoths. Circle-Of-Two heavy interdictors were the first to close the distance, their scripted heavy interdiction spheres immobilizing the giants and preventing them to warp off with focused warp disruption fields. The DRF fleets realizing the danger immediately gave chase, the Tengu fleets in particular burning in range of the Revenants for their logistics wing to give assistance with their shield transfers. By then, the Machariel fleet and Circle-Of-Two Proteus fleet were swarming the super capitals, holding the Revenants down and starting to chew through their thick shields. Suddenly, only 10 kilometers away from the tackled DRF super capitals, a cynosural beacon lit, and into the field jumped no less than 22 Snuffed Out\Project.Mayhem. super carriers. The battle had became a full super capital brawl. The new arrivals aligned away from their hostile brethren and let loose with their own flights of fighter bombers, targeting enemy force auxiliaries and dispatching them one by one. In between, the fighter bombers were sent to attack the Revenants, torpedoes and cannon fire thrown against their robust shields. Archon carriers which accompanied the Snuffed Out\Project.Mayhem. super carriers set to the task of disarming the hostile super capitals, targeting their fighter bomber squadrons. The DRF was not idle either, and targeted enemy capitals and force auxiliaries in return. An ugly exchange of capitals ensued, as the two sides worked to break each others’ logistics backbone. All this time, slowly but surely the Revenants were brought down, the different allied fleets blasting at their shields in devastating volleys. Shield reactors overloaded and burnt out under the relentless fire poured against the super carriers. Finally, the last reactors had been forcibly shut down, leaving the ships defenseless. With their shields gone, the Revenants proved remarkably fragile, their armor plates inadequate in the face of the firepower poured against them. One Revenant suddenly faltered, going dark before suddenly lit by the internal inferno unleashed by its overloading reactors. Explosions ripped apart its superstructure, with concentric blast waves radiating outwards and damaging nearby ships unlucky enough to be close enough to witness the giant’s death throes. The explosion ripped apart the hull, leaving huge chunks of structure adrift in space, surrounded by debris and gas nebula formed of water vapor. Without delay, the allied fleets switched their focus to the second Revenant and started pummeling it with their entire available firepower. It too languished shortly under the enemy fire before caving in and sharing the fate of its sister. With the two Revenants down, the allied fleets started making preparations to withdraw. Under no illusion that they could win the fight, allied fleet commanders put the extraction of their super capitals as top priority. DRF forces, though suffering grave losses, had the advantage of a stream of continued reinforcements from its staging system literally only a gate away. Thus, the allied firepower quickly focused on clearing any heavy interdictors present on the field. As DRF heavy interdictors were felled in growing numbers, the order was given for the Snuffed Out\Project.Mayhem. super carriers to warp off. Most of them made it off the field to safety, except one Nyx super carrier. The Nyx was caught by the DRF fleets, which had been swarming the hostile super carriers. Heavy interdictors managed to hold it down, while the Proteus fleets simply burnt on top of it, their warp scramblers added. By then, the DRF forces had lost most of their heavy interdictors, but with the amount of warp scramblers present on the field, the DRF was able to easily overcome the natural strength of the Nyx’s own warp drive. The allies tried to free the Nyx, switching fire to the strategic cruisers themselves, but to no avail. It was then that a brave maneuver by a Circle-Of-Two command destroyer saved the tackled super carrier. Managing the teleport a great chunk of Proteus strategic cruisers away from the Nyx, it was able to decrease the overall strength of warp scramblers on the field. This was later aided by another DRF mistake, as the Proteus fleet in an attempt to regroup, warped off its remaining strategic cruisers on the Nyx, freeing it completely. Without delay, the Nyx was warped off the field to safety, quickly followed by the Machariel fleet and the Circle-Of-Two Proteus fleet with any remaining capitals that were not in triage or siege mode. This left Out of Sight. which remained orbiting the fight, shooting support and looters, who were descending on the field in growing numbers. The DRF for its part extracted its own super capitals and any remaining capitals, while recovering whatever it could from the wrecks of its own and its enemies fleets. With the battle won and the Fortizar secured as well, DRF forces extracted from the system as well, putting an end to the fight. All told, the battle lasted 1h and 40 minutes with Time Dilation rising to 20% and remaining there for most of the fight. The system itself hosted nearly 1100 players at the peak of the fighting. DRF lost 353 ships including 2 supercarriers, 17 dreadnoughts, 4 force auxiliaries and 78 strategic cruisers for a total of 482.14 billion ISK damage. Project.Mayhem., Snuffed Out, Circle-Of-Two and Out of Sight. lost a combined 160 ships including 15 dreadnoughts, 14 force auxiliaries, 4 carriers, 26 battleships and 16 strategic cruisers for a total of 137.75 billion ISK damage. *All images in this article are the property of Ender Ambrye of Risk Breakers, Snuffed Out and used with his knowledge and consent. encountering troubles with your RSS. I don’t understand why I am unable to join it. Amazing! Its in fact remarkable article, I have got much clear idea regarding from this post.